Heitor Villa-Lobos was one of the foremost composers of the twentieth century, combining elements of music indigenous to Brazil and Latin America with Western classical music. His work is heavily influenced by Johann Sebastian Bach (e.g., Bachianas Brasileiras), Richard Wagner, and Giacomo Puccini). Born in Rio de Janeiro on March 5, 1887. he started learning the cello at age 6. Although his mother did not approve of his musical aspirations and wanted him to become a doctor, Villa-Lobos left home at the age of 18 and supported himself playing the guitar and cello while travelling around Brazil. In 1915, his works were featured in a concert in Rio de Janeiro and the publishing firm Artur Napoleão began to publish his compositions. In this year, he also met pianist Artur Rubinstein, who performed his works across the world. From 1923 until 1929, he lived in Paris, composing, and organizing a number of concerts. In 1930, he became director of the São Paulo school system in Brazil and in 1932, he became in charge of music education throughout the country. In 1945, he established the Brazilian Academy of Music with Oscar Lorenzo Fernandez. By the time of his death, in 1959, Villa-Lobos had written over 2000 compositions, including orchestral, chamber, instrumental, and vocal works. His guitar compositions, in particular, have become part of the standard repertory for the instrument. Villa-Lobos married Lucília Guimarães, a pianist and teacher, in 1913. In 1936, he left his wife for Arminda Neves d’Almeida, who remained his companion until his death, Arminda took Villa-Lobos' name, although they never married. Many of his works are dedicated to Arminda, or "Mindhinha." 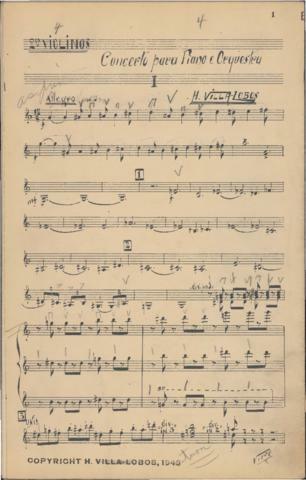 Item is one of seven first violin parts for Heitor Villa-Lobos' first piano concerto, dedicated to Ellen Ballon. The part was copied by Fran Averede. This work is in the public domain in Canada, but is not in the public domain in other jurisdictions such as the United States or Brazil. Please obey the copyright laws of your country. It is your sole responsibility to verify whether the file available for download and viewing is in the public domain in your country or if downloading a copy constitutes fair use. The part was annotated by one or more performers. Description created by Rebecca Shaw on January 31, 2018.